• imagining creative alternative futures. Penn State's Geodesign program is rooted in an established framework that, coupled with enhanced technologies, provides a sound basis for helping communities address their challenges, including knowing the key questions to ask, how to discover which data are most appropriate, and how to assemble the right team of collaborators. Over the past 30 years Dr. Steinitz(1) has established a framework proven to work well from large projects to regional scales and in diverse circumstances. Graduates will be capable of taking communities through this geodesign process—thus enabling a future based upon the most informed decisions possible. Here are some links to useful resources about our curriculum. 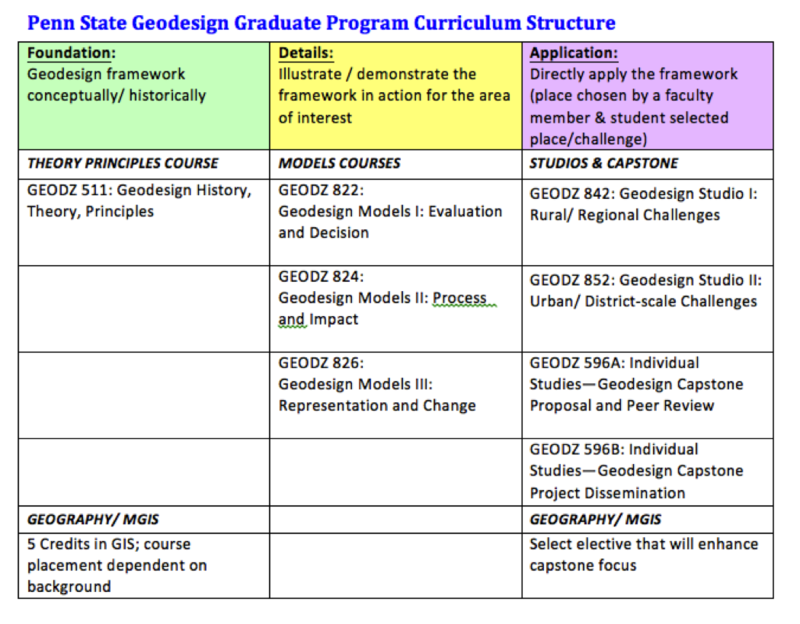 For a full list of avaible Penn State Masters in GIS courses, visit the Penn State Online Geospatial Education website.